If you prefer to explore Maui in the daylight hours, the Haleakala, Upcountry, Iao tour will will bring you to significant cultural sites and you will learn how ecological systems function and more! Immerse yourself in the island’s culture, farming practices, bird watching, food practices, fishing, climate zones, and how Hawaiians malama aina – care for the land. 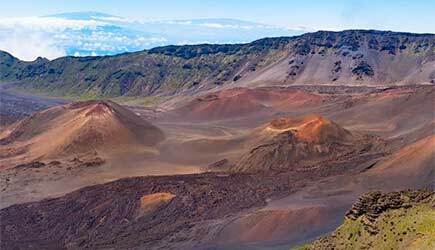 Experience Haleakala in the daylight hours on this tour! Enjoy a delicious lunch and wine tasting at MauiWine! Along with the breathtaking Haleakalā National Park, experience Maui’s award-winning winery, MauiWine! After you visit the summit of Haleakala, you will be taken to MauiWine for a hosted lunch at the Ulapalakua Ranch Store. Enjoy an exclusive wine tasting experience, and stroll through the beautiful property. Walk through the lavender grounds, or relax and enjoy the views! Explore Haleakalā National Park, Ali’i Kula Lavender Farm, and Upcountry Maui in one unforgettable day! After seeing the vastness of Haleakalā National Park, you will be taken on a guided tour of Ali’i Kula Lavender. Next, you walk around the historic paniolo (cowboy) town of Makawao where there are unique art galleries, gift shops and boutiques. Experience an epic sunset at Haleakala! This tour is a great option for guests who prefer to sleep in, and it is an equally dazzling show of light and color as sunrise tours, but at twilight. 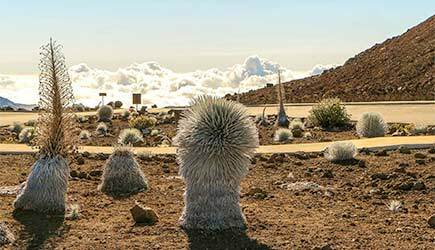 Enjoy the view at 7,000 feet elevation at the Haleakala Ranger Station, and experience amazing crater views at 9,740 ft at the Haleakala Visitor Center. Gaze upon the sunset atop beautiful Haleakala. Dinner is included and will be in central Maui at Cafe O Lei at the Dunes. On this tour you will travel in comfort in a new Grech mini coach with panoramic windows. If you’re interested in only biking Haleakala during the day, check out the Downhill Bike Tour! Pride of America cruise ship passengers are able do the Haleakala Daytime Summit and Maui Wine Tour OR Haleakala Daytime Summit, Lavender Farm on their second day in port in Kahului. They will pick you up at the harbor. Haleakala, Upcounty, Iao tour is not recommended for cruise ship passengers.